While the leaders of the Bolshevik revolution were made up highly educated revolutionaries who trained body and mind to overcome the constraints of the the capitalist bourgeois, most of the population (around ninety percent) was of the peasant class. Most of the peasants in Tsarist Russia were illiterate, uneducated, and knew little of the world outside the villages that dotted the countryside. These villages were scattered over the 6 million square miles of Russia making contact with all of them a challenge. For the Bolsheviks, an organization that placed great value on the power of the grassroots peasants, this was unacceptable. They needed the peasants to be aware of the changes taking place over the revolutions in the early 20th century, as well as a work force who would be educated in the doctrine of the new communist government. When the population of a country is educated, the value of its human capital increases. This makes the work force more efficient and worth more to the state. With the bureaucracy of the Bolsheviks beginning to follow the philosophy of scientism, the view towards the peasant population changed from indifference, to a need to directly control and educate in order to get the highest production possible out of its workers. The population needed to be in agreement with the actions of the state as well to make the machine of communism run smoothly. Obedience to the state was necessary, and by using propaganda to educate the unlearned peasants they could be made loyal to the Soviet cause. The Bolshevik’s needed a way to reach these people and spread the word of the revolution to the masses. But struggling with the sheer size of the newly formed Soviet Russia was a herculean task. In the early twentieth century the most effective means of traveling the country was by rail systems. Because of the rails already set in place throughout Russia the logical way to reach the people was to use the trains. 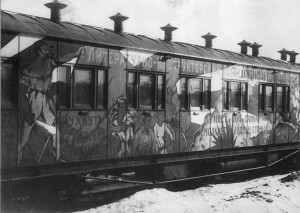 The first of the trains to reach the isolated peasantry was know as “Lenin’s train.” This train was made up of 15 cars and “decorated with paintings in bright colors, with forceful and unmistakably revolutionary inscriptions.” It is important to note, that the officials onboard the train were members of branches of the “people’s Commissariat.” These men would distribute masses of pamphlets and readings free of charge to the people, as well as answer questions and advise on issues concerning the population. This was a powerful tool for the Soviet government to use, as the population will feel heard, and important to the government. This in turn will promote less resistance to newer ideas and obedience. The feeling of solidarity between the government and the workers was to be fostered in this way. The success of such trains in spreading soviet propaganda prompted the creation of three further trains, with different routs that would bring the word of the “Revolution” to the “most hidden nooks of Soviet Russia.” These propaganda trains would be responsible for returning the wishes of the people to the government and create an environment where capitalist imperialism would be unable to return to the minds of the population. Hoffmann, “European Modernity and Soviet Socialism” in Hoffmann and Kotsonis, eds., Russian Modernity: Politics, Knowledge, Practices (NY: St. Martin’s, 2000), 245-260. This entry was posted in HIST254-Archive and tagged communism, h254, HIST254, propaganda, Russia, soviet union, USSR by Sam Krauskopf. Bookmark the permalink. Geography is something that must come up in a discussion about any nationwide movement or ideology attempting to harness Russia. It makes the nation unique, and incredibly difficult to effectively control. I agree that this particularly posed a problem for the Bolsheviks who chose grassroots style politics and had a great interest in engaging with the illiterate peasants rather than just keeping them under the yoke of serfdom. These rail trains served the twofold purpose of connecting the Bolsheviks to the countryside and hopefully inflaming those peasants who could understand the images and words displayed on them. You also alluded to the importance of education, which would allow lower classes to understand the propaganda presented to them and begin to understand the revolution of which the Bolsheviks wanted them to be a part. The rather epistemological idea posed by Hoffman concerning the transformation of the populace into a mass of resources and capable, educated spokes in one enormous every-turning wheel is one significant implication of such implementation of trains specifically furnished for the purpose of spreading propaganda. Your point of how the Bolsheviks’ surprisingly quick grasp (in about the span of two months) of the country and its many groups of people stemmed from the overall desire to hold control over the loyalty and political leanings of the peasants is key to understanding Lenin’s motivations in spreading his revolutionary ideas to the respective social classes. As discussed by both Alicia and yourself, the trains were able to bypass the impediments of illiteracy and a large spanning geography, both figuratively and quite literally. With these two obstacles left vulnerable to conquest, the daunting shadow of the Bolsheviks’ grand palm ever so gradually ascends over Russia. The image of trains is very interesting because it eventually changes from being seen as this modern mode of transportation and even communication in the early soviet period to a sign of backward or even dirtiness after the fall of the regime. Then this technology was something to be proud of but now it brings to mind the harsh industrialization period which the peasants at this time weren’t fully aware of yet. The Bolshevik’s use of trains to spread their influence to the peasants served many purposes, one such purpose as you identified as being the ability to build a sense of “solidarity between the government and the workers”. By conversing with the peasants in their home environments they were able to feel closer to the revolution, even when they may physically be miles from the political centers of Russia. With much of the peasant population illiterate, the texts available to them were often Bolshevik documents, further ingraining the ideology into the masses as they became literate. If the White troops were able to unite enough to also employ the Bolshevik tactic I wonder if there would have ben any significant shift in support among the peasants to the White troops.